Explore unique old world architecture and high desert landscapes. A private photo tour is a one or multi-day event designed to maximize time creating images in inspirational locations and tailored to your preferences. We take you to places in New Mexico where we know the lighting and seasonal conditions intimately – locations we’ve explored and photographed for years that have yielded successful commercial or personally rewarding images. A uniquely personal and exclusive photo tour for individuals, couples and any private group up to 4. Non-photographer companions, partners, family members and friends are always welcome. ✓ Can be up to four participants all from the same party. Not all people in your party have to be photographers. We regularly take non-photographer companions and family members. ✓ Start and end times vary depending on time of year and are determined upon booking. ✓ A detailed recommended camera equipment and suggested clothing list and custom itinerary will be sent to registered participants via email shortly after booking. 1. Complete the form found at the “Book NM Private Tour” button above with your preferred tour dates to verify we have no other conflicts on your desired date(s). 2. As we may be traveling on the road or out on a shoot at the moment, we will be contacting you either by phone or email within 48 hours of receipt of your form to discuss your request. 3. Once an available date is confirmed, a deposit link will be emailed to you so you can reserve your tour date by making a 20% deposit. Payment can be made via credit card through PayPal (no PayPal account required), check, or money order. 4. Final payment is due 30 days prior to your reserved start date. 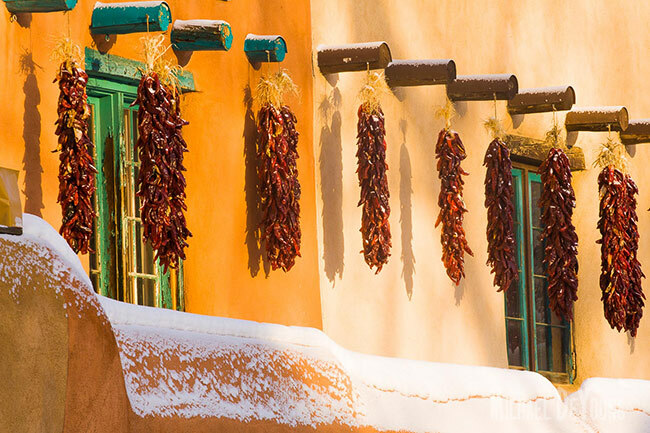 Taos, Taos Ski Valley, Rio Grande del Norte National Monument, & the High Road featuring adobe architecture, old-world charm, mountain views, & the Rio Grande Gorge. Abiquiu and Ghost Ranch in the Rio Chama Valley (1.5-2.5 hours drive from Taos) featuring captivating desert red rock and river country. This is Georgia. O’keefe country. PAYMENT TERMS: A minimum deposit is due at registration to reserve your space. Required deposit amount is 20%. Final payments are due 30 days prior to tour start date. Cancellations occurring prior to 30 days of reserved date will be eligible for a refund of amount paid to date minus a $50 processing fee and any non-refundable deposits made to additional venues (such as lodging facilities or charter companies). Cancellations occurring within 30 days of reserved date will be eligible for a refund of amount paid to date minus the initial deposit fee, a $50 processing fee and any non-refundable deposits made to additional venues (such as lodging facilities or charter companies). In the event you are unable to make your initial date, we will work with you to reschedule without forfeiture of deposit although we understand rescheduling is not always possible due to both parties schedules. We are not responsible for reimbursement of non-refundable airline tickets or lodging arrangements you made in the event of you or anyone in your group had to cancel. You may want to invest in trip insurance to cover these circumstances. We highly suggest TravelGuard® or similar travel insurance policies to assist you in case of last minute plan changes and emergencies. For camera clubs and corporate groups of more than four, please contact us below for custom quotes and packages.